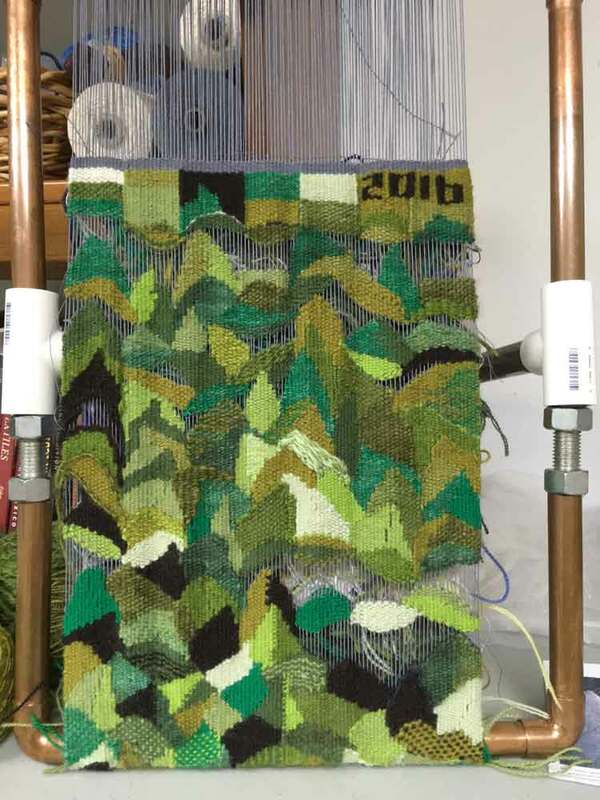 Last year at the beginning of Advent I started a tapestry diary, a piece in which I planned to weave a little bit every day. I wanted to follow the liturgical calendar, using the colors for each season of the church year. 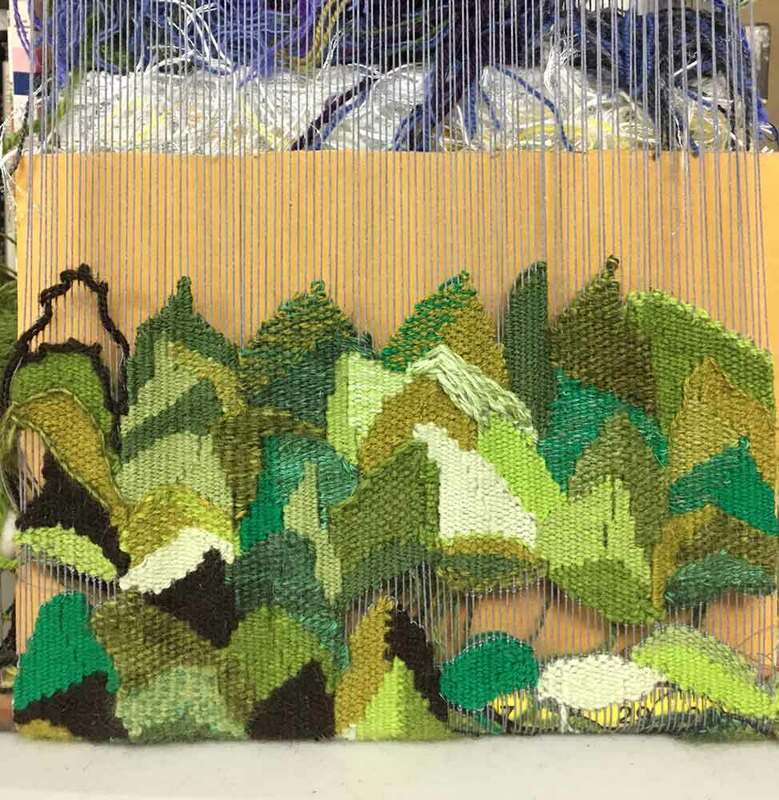 I hoped it would be a small devotional project, and a way to ensure that, whatever else might be happening in my life, each day would include at least a short session of meditative weaving. Last Saturday I wove the last day of the liturgical year, and on Sunday a new year began with the first day of Advent. Weave every day in the color for that season. Use scrap yarn on hand. 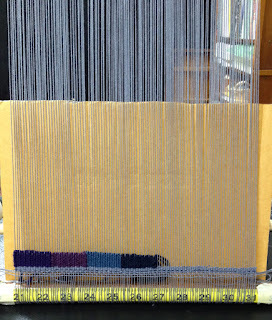 If away from home, leave open warps (do not weave) for that day or days. It has been such a rewarding experience, in unexpected ways. It has also been humbling, as I have found that eventually I broke every rule I set for myself, for what seemed like good reasons at the time. (Isn't that always the way?) I strayed from the prescribed colors, for expressive reasons. It seemed appropriate to convey Easter joy by using silver and yellow as well as white (and more visually appealing). I had to use brand new yarn in order to have enough of the right colors. 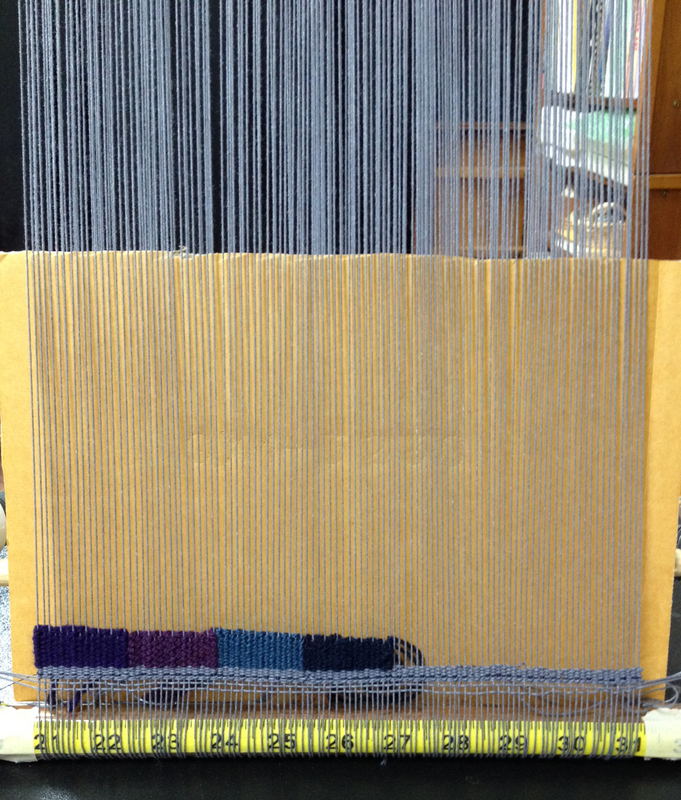 I did leave open warps for days away from the loom, but I also included open warp spaces purely for design reasons toward the end of the year. And I did unweave and re-weave in a few places where I just couldn't live with my mistakes. a couple weeks into Ordinary Time, the green season of growth following the white Easter season. Each day I wove a new leaf motif. 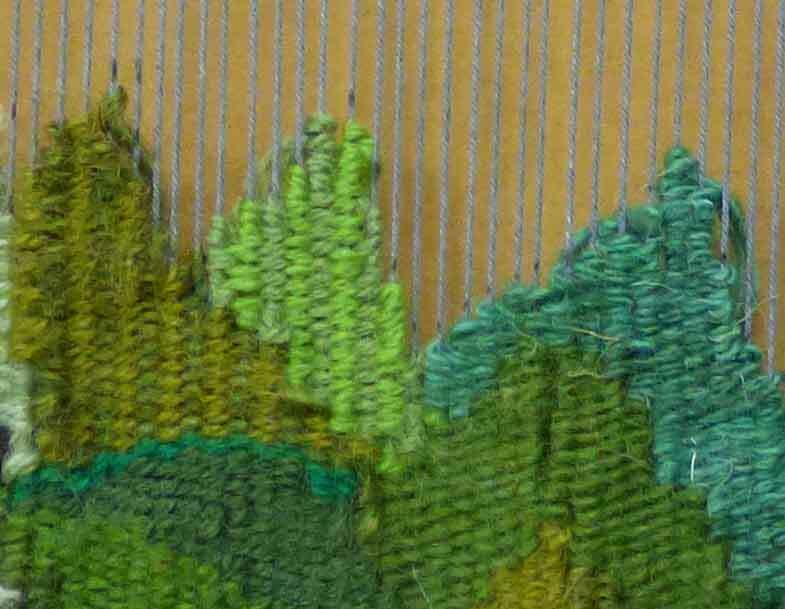 I also found that much more than a meditative practice, the diary was a great chance to practice the craft of tapestry weaving. I improved my skills in pick-and-pick, double half-hitching, slits and dovetails. I became much more comfortable weaving spontaneously, making up each day's shape without a plan or a cartoon, though sometimes I did ink the warp a bit. You might recall that it was a summer in which news of one mass shooting or terrorist attack followed another. I began to weave brown leaves each day there was news of an attack, whether here at home or abroad. Orlando. Istanbul. Baton Rouge. Minneapolis. Dallas. Nice. Tokyo. And so on. An acquaintance of mine hiked the entire Appalachian Trail this year, from Georgia to Maine, from March to September, and he wrote about his adventures in the local paper. 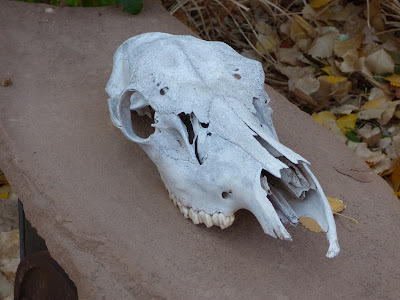 "The Trail provides," he wrote once. 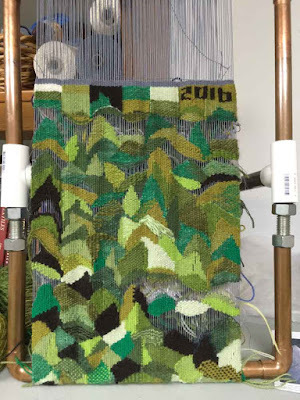 Weaving a tapestry diary is also a long journey. 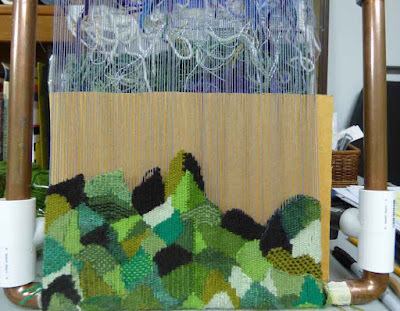 Each day's time at the loom provided practice for me in moving forward in faith, despite distractions, heartache, tiredness, and uncertainty. 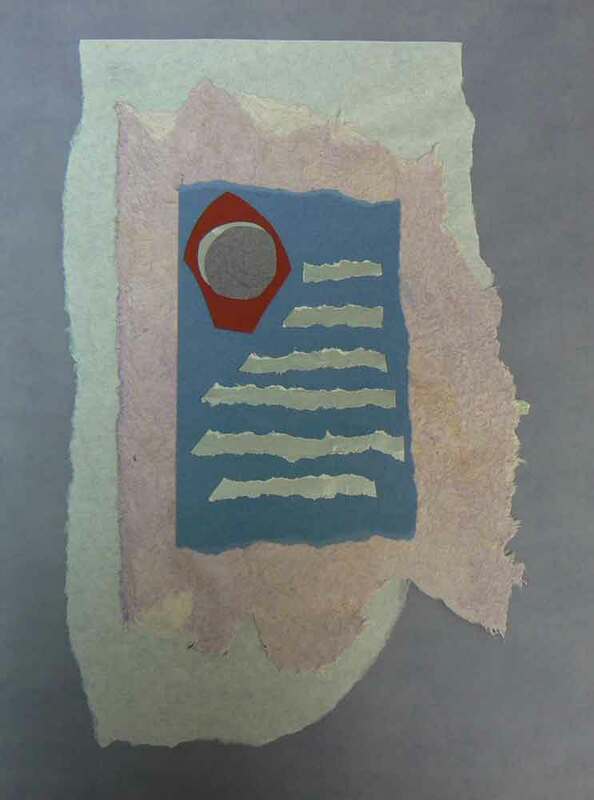 Best of all, the diary practice also generated a wealth of new ideas for new work, and this was most exciting of all. I have two pages of ideas for next year's diary, which I will start on January 1, 2017. It's amazing what can happen when you commit to moving forward a little bit, every single day. 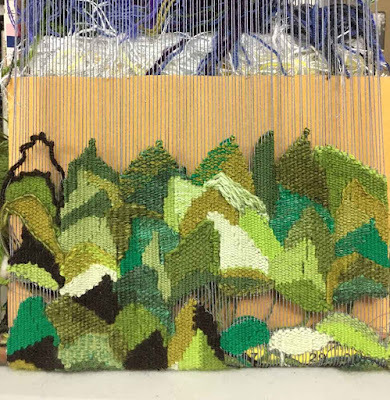 If you're interested in discovering your own daily practice (it doesn't have to be weaving), I'll be offering a short workshop at SEFAA in Atlanta, on January 15. Registration will open mid-December. 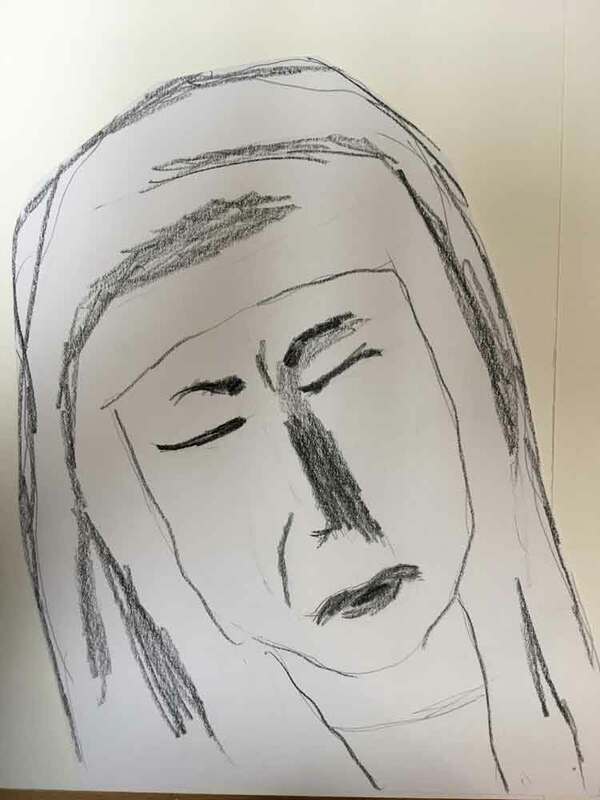 One way I've found to conquer my drawing anxiety and even sometimes made some interesting drawings, is to do blind contour drawing. 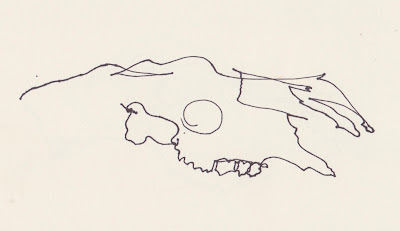 Basically the idea is you slowly run your eyes along the contours of an object and use your pencil to trace those contours, without looking at the paper or raising your pencil from the paper at all. Obviously it will not be an accurate likeness, but the lines that result can be sensitive and engaging. You can find a good 3-minute video tutorial HERE. I've also used the instructions in the classic book by Betty Edwards, Drawing on the Right Side of the Brain. 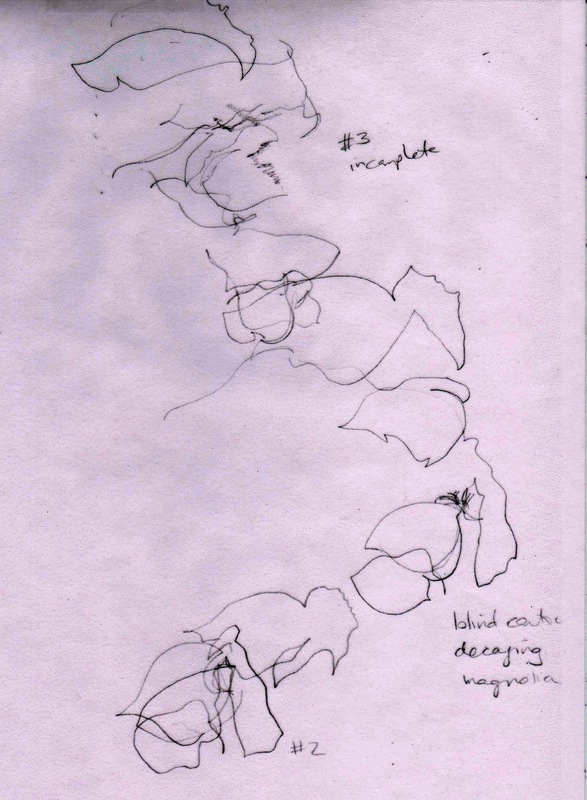 I did a blind contour drawing of a hanging plant several years ago that I really like. I love how it conveys the feeling of an organic descending form without the fussy detail. 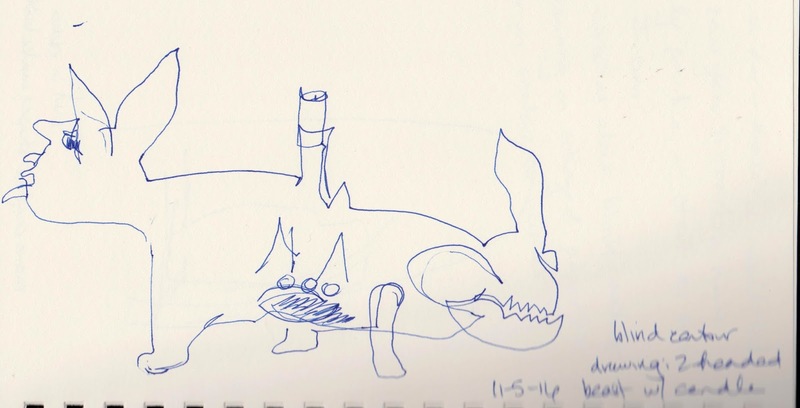 I love how the contour drawing (done from a side angle) captures the weird shapes and energetic lines of the skull and teeth. 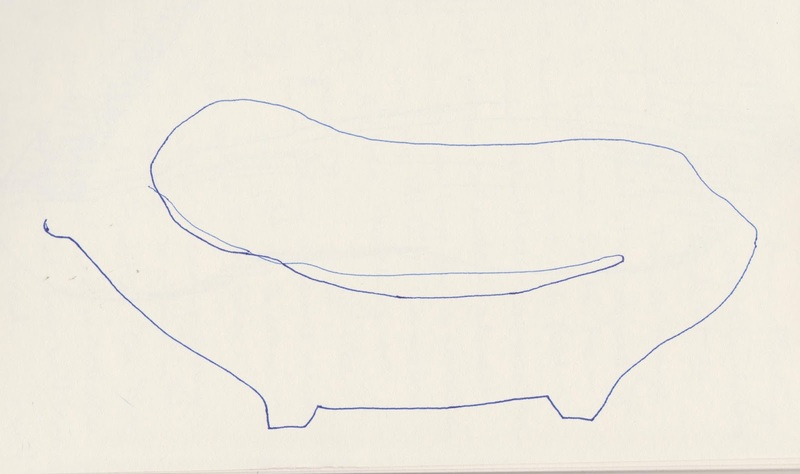 I also did a blind contour drawing of a large wooden bowl. Simple, but I find it amusing that the shape isn't closed and the edges not connected. I also drew a candle holder with interesting Aztec-type figures. 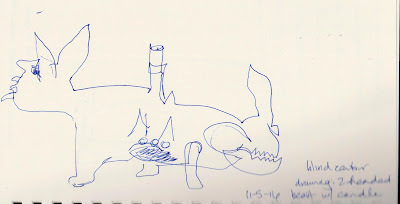 I've learned that the most interesting blind contour drawings are of complex objects. 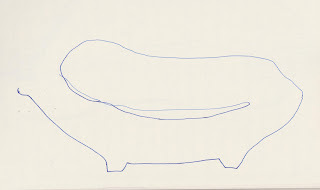 If the object's outlines are too simple there is not much room for eccentric lines and shapes to develop. For the past week or so I've been working on the design for the next tapestry in my Mary series, a piece on the Mater Dolorosa (sorrowing mother) theme that is one traditional type of Mary icon. The icon I've been using as my source for previous tapestries depicts a placid Madonna. 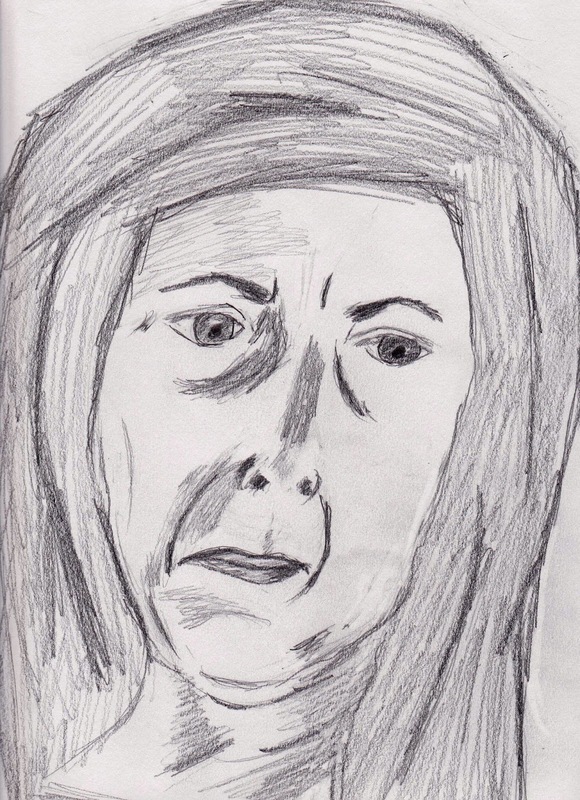 I needed a face that expressed grief and sorrow. Lacking any handy sources, I made a face and snapped a quick selfie. I deliberately posed looking downward. 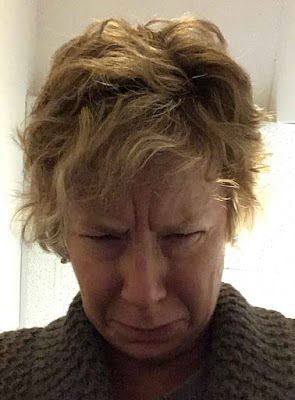 Possibly the most unattractive selfie ever! Go ahead and laugh! Then I made a quick and loose sketch of the selfie face, adding the iconic veil. I was eager to plug this image into an overall composition I had in mind so I worked fast and didn't belabor the sketch. I don't want to overstate this, but this is possibly the loosest, most expressive drawing I've ever done. 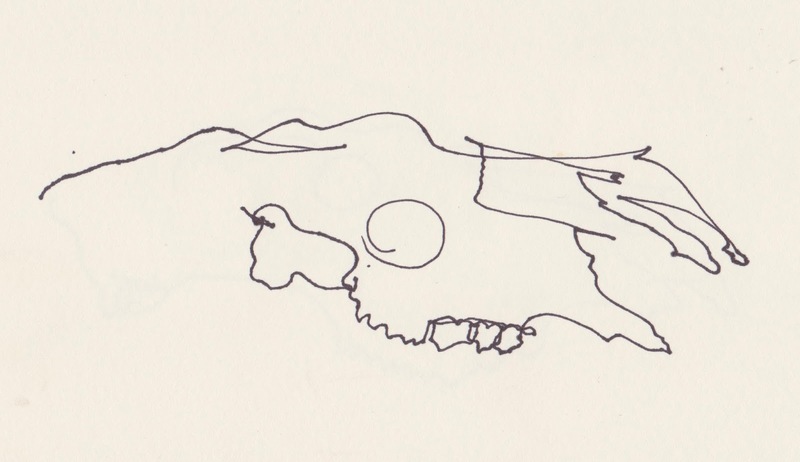 Maybe all that low-stakes blind contour practice recently loosened me up. Maybe I did the sketch quickly enough that I didn't give myself a chance to get all tight and nervous about drawing. Today I tried another version, also based on a selfie, with open eyes this time, and the head tilted slightly the other way. This one I labored over a bit more, and it shows. Not sure yet which one I'll use in the piece. 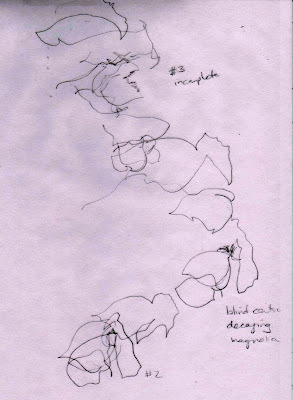 Back to the studio. . . .
Have you ever experimented with blind contour drawing? What was it like for you? 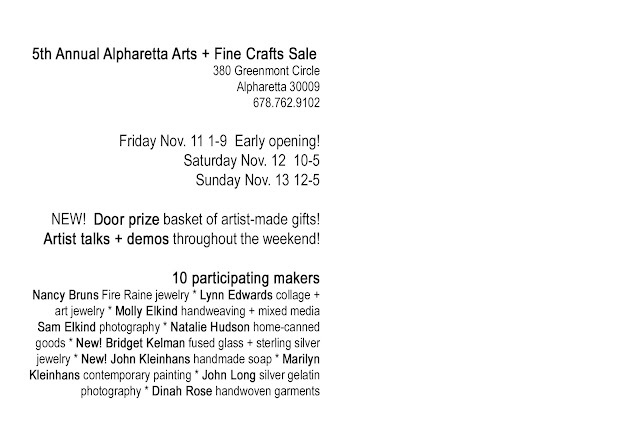 I am so humbled and grateful for the wonderful turnout for our annual Alpharetta Art + Fine Craft Sale last weekend. We saw an uptick in the number of guests and sales throughout the weekend. I think our fabulous roster of ten artists and makers had a lot to do with that, especially our two newest additions (you know who you are!). And folks enjoyed learning more about the nuts and bolts of photography, tapestry, and jewelry techniques from the five artists' talks as well. I for one have a whole new appreciation of chain mail weaving--so much math! So if you came, THANK YOU from the bottom of our hearts--and if you missed it this year, well, there's always next year! Let me know if you need to be added to our mailing list. Here are a few of my pieces that found new homes. 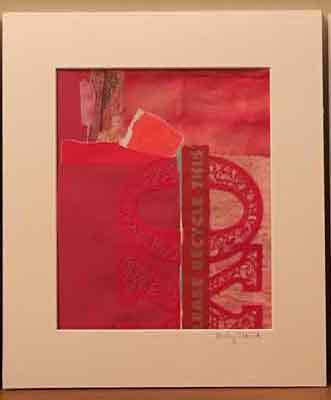 This is a motley assortment that includes both recent work and pieces from previous bodies of work. 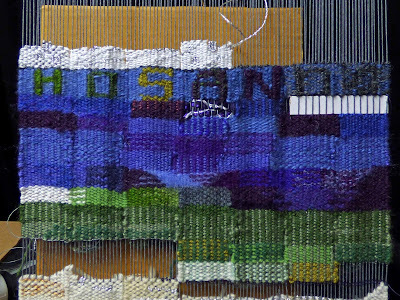 Going forward, I am focusing on handwoven tapestry and collage. (I do have a few handwoven scarves and wraps if you are interested!) 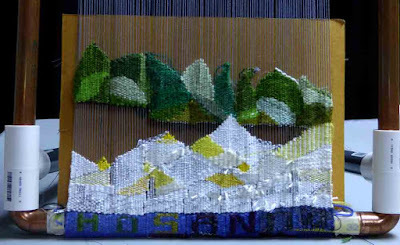 Please check my website to see what's available both in handwovens and work for the wall. 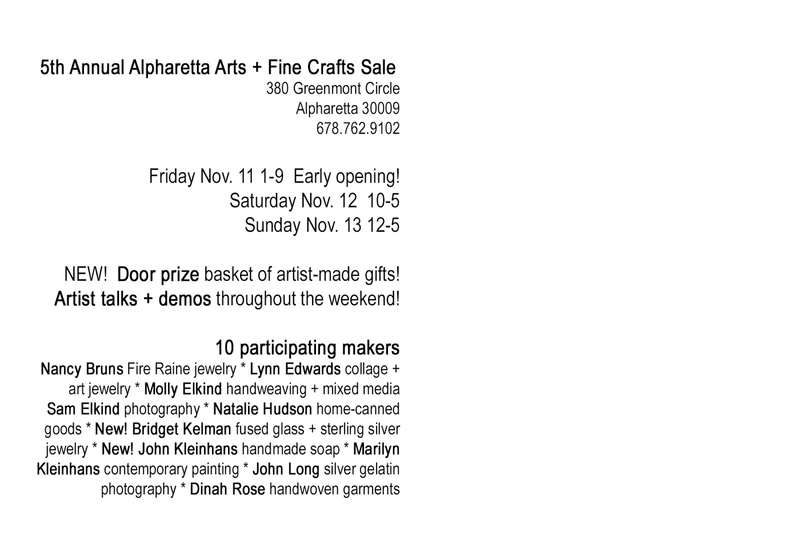 This weekend Sam and I and eight of our artisanal friends are throwing our FIFTH annual Alpharetta Art + Fine Craft show, at our home in Alpharetta. You're invited! I can hardly believe we've been doing this for five years already. This year we've added several new features to make it even more fun for everyone. 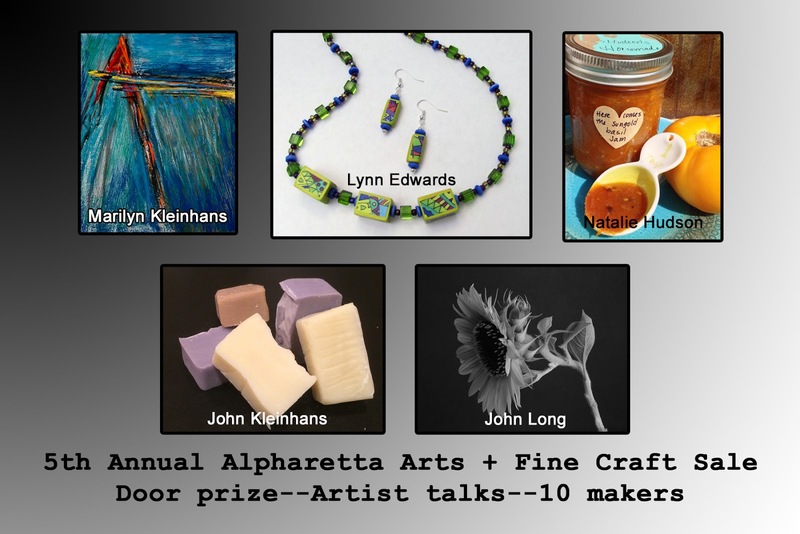 We've added two new artists: Bridget Kelman, who does jewelry and home decor pieces in colorful fused glass, and John Kleinhans, who makes luscious handmade soap. I've used this soap and it's a real treat. 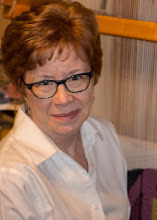 Dinah Rose, weaver of boho improvisational garments and accessories. 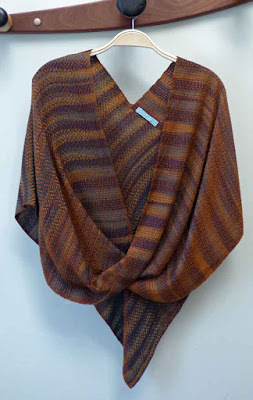 And there's me, Molly Elkind, showing handwoven scarves and infinity wraps (get 'em while they last!) 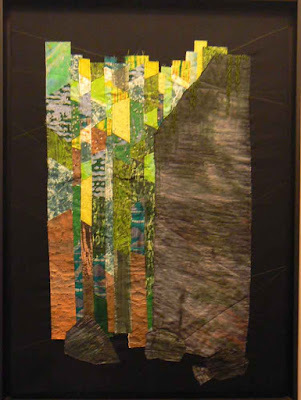 and some of my newest collages and tapestries. There's truly something for everyone on your gift list (and maybe yourself too) and every budget, starting at about $5. And how about FREE? Admission to the show is, as always, free. 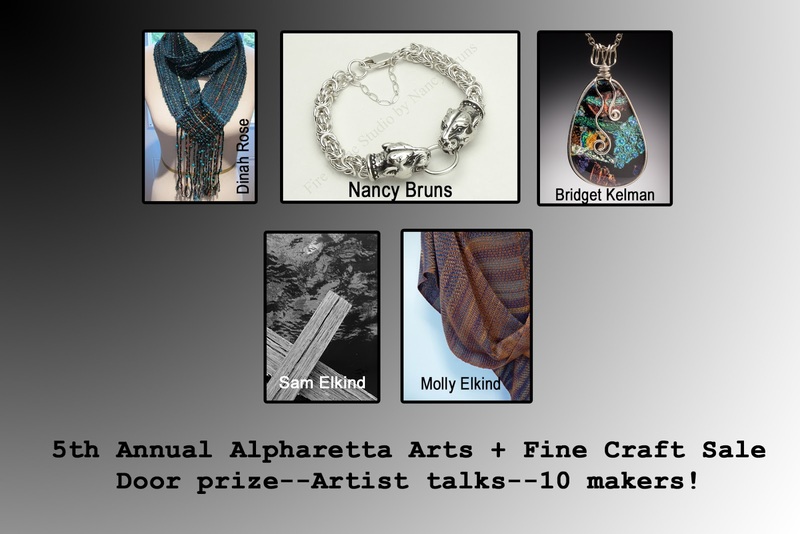 And for the first time, if you share your contact information you are automatically entered into a drawing for a gift bag stuffed with handcrafted items from each artist in the show (one-of-a-kind jewelry, original art and gift items). We'll do the drawing Sunday afternoon but you don't need to be present to win. I know what's going into this bag and I can tell you, you want in on this! You might want to plan your visit around one of the following special times. We're opening early on Friday this year, at 1:00 for those early birds who don't want to get into Friday evening traffic. If you do venture out Friday night, you'll enjoy wine, appetizers, and artists' talks! These talks are short and informal, and you're welcome to browse and nibble as you listen. On Friday at 6:00 pm John Long will speak about his traditional photographic processes and equipment, and Sam Elkind will share tips for making your own photographs even better. At 7:00 pm Friday Lynn Edwards will discuss what to keep in mind when purchasing artwork. The artists' talks and demos continue through the weekend. 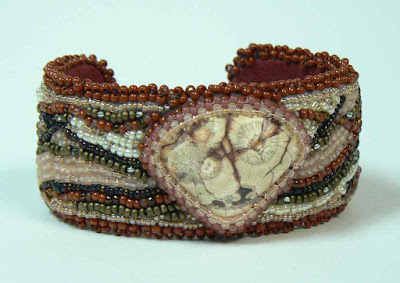 On Saturday at 11:00 am, Bridget Kelman will demonstrate the wire-wrapping technique she uses to make some of her fused glass jewelry. 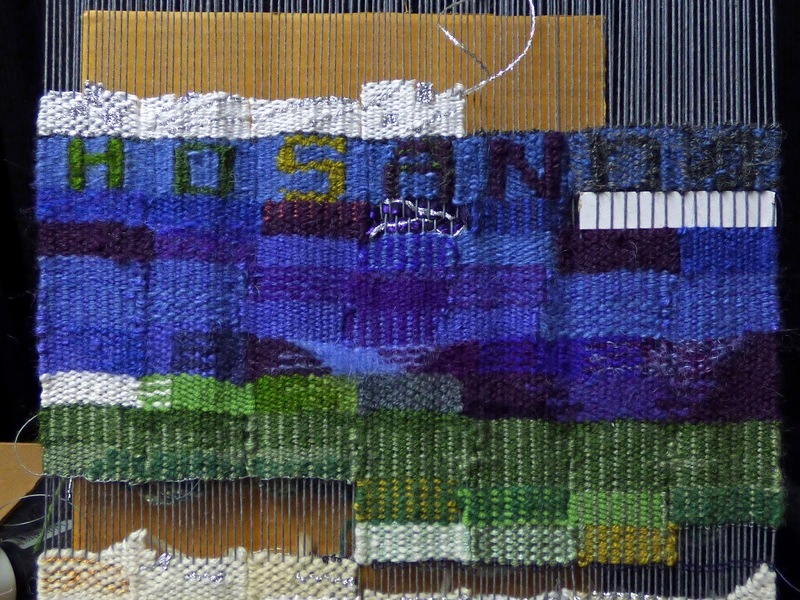 At 2:00 Saturday afternoon I'll talk about what tapestry weaving is and why I do it. On Sunday at 1:00 pm Nancy Bruns will demonstrate the art of chain mail weaving with the precious metals she uses in her jewelry. Let me know if you need directions or more information. Hope to see you this weekend! Come out, enjoy refreshments and the congenial company of artists and friends!